I was going to make the adjective closing this post’s title ‘universal’, but that’s not the point I want to make. The point currently invading my brain (at the expense of my original plans for tonight, Christianity After Constantine) is that God is not simply ‘The God of Everything’ but the God of Where You Are. He is intimately connected with you and where you live. And how can we perceive the localness of God? The stories of His saints. God is not a Middle Eastern or Mediterranean God, although the stories of the Bible all take place in those two locales. No, God is also a British God. A Canadian God. An Ecuadorian God. A South African God. Of course, immediately I must say that the scandalising particularity of the Incarnation means that the heart of Christianity is based around a first-century Jewish carpenter who was executed by the local authorities. But when God was killed by us, and then rose again, and subsequently ascended, He made Himself available to all people. That particular moment, that event, makes God able to be universally local. 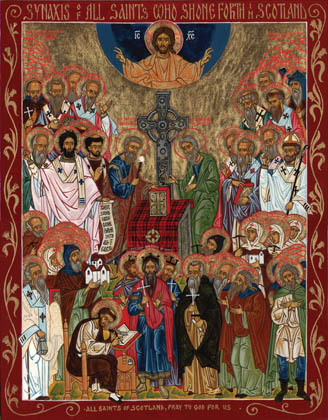 The faith community that surrounds the Jesus event(s) is called by St Paul ‘the Body of Christ’. The Holy Spirit indwells each and every believer. God is not just the God of the Bible. He is the God of wherever His people are. Our story is His story, for He has lived through it all by the mindblowingly awesome power of the mystical union He shares with us, a spiritual bond that is well-nigh unbreakable. God, as I said, is also a British God. I bring in Britain because I live in Scotland. The stories of God are not just shaped by the warmth and aridity of the Judaean countryside, but the chill and dampness of Britain. God has been here, and not just as Creator, a way in which He is present everywhere in an equally intimate way. God was here in Scotland with Columba, an Irishman (saint of the week here). God was here in Ninian, a Briton. God was here in Adamnan, an Irishman. God was here in Margaret, an Anglo-Saxon. God was here in Cuthbert, an Anglo-Saxon (saint of the week here). God was here in Blane, a Scot from Bute. God was here in Curetan, a Scot (Pict?). God was here in Sts Fillan, who were Irish. God was down in England in Cuthbert, an Englishman. God was there in Bede, an Englishman (saint of the week here). God was there in Augustine, a Roman (saint of the week here). God was there in Aidan, an Irishman (saint of the week here). God was there in Caedmon, an Englishman (saint of the week here; also, read my translation of Bede’s telling of his life). God was there in Hilda, an Englishwoman (saint of the week here). God was there in Alban (I dunno where he’s from; saint of the week here). God was there in Aelfheah, an Englishman (saint of the week here). If I knew any Welsh saints, I’d list them, too. God was in Britain with these saints as well as throughout the Middle Ages, Reformation, and up to this very day. They were characters who lives and personalities were shaped by the weather and history and culture of this island. Christianity is, perhaps, a universal religion. Yet everywhere we go, we are shaped by our stories here, by the experience that the Body of Christ has in these locations, at these times, with these people. And so, if we are seeking for local spirituality, for British, or Scottish spirituality, it is here. Hilda was born here, and she found Christ already waiting. He is here, and He has shaped this island’s history. We need not look farther than the green hills or craggy cliffs to find him. We need look no further, indeed, than our very hearts.